Login Access Moved to Scoutbook! Troop 637 has been in existence for 25 years. We maintain a rich tradition of empowering scouts to become leaders through troop meetings, outdoor adventures, and community service projects. We are a very active outdoors troop camping year-round at least once a month. Our troop's charter organization is the West Douglas Fire Protection District. Troop 637 is a scout led troop. This means that the Scoutmaster and all Assistant Scoutmasters do not plan or lead any of the meetings but they occasionally jump in when needed. The acting SPL (Senior Patrol Leader) and a few other guys that the SPL chooses (his Patrol Leader Council - PLC), lead the meetings. The SPL and the PLC also plan the annual camping calendar. Our troop serves the Sedalia, Larkspur, Perry Park, Castle Rock, Castle Pines, Castle Pines North, and surrounding areas. That does not mean you have to live in those communities to join our troop. The meetings for Troop 637 take place every Tuesday from 7:00 to 8:30 at Sedalia Elementary School unless there is a holiday and the school is closed. We meet at alternate locations during summer, when the school is closed. A meeting usually consists of an opening flag ceremony, then we all participate in a skill activity, which could be learning how to tie a knot, or something related to first aid, which follows with a game about the skill. The meetings are focused on rank advancement, merit badges, and preparing for upcoming campouts. Then we all gather together at the end of the meeting and do what we call “circle up.” The "circle up" is where we all get into a big circle and anyone who wants to can give an announcement about up-coming events or anything they believe should be mentioned. After everyone has said what they need to announce we have the Scoutmaster give a “Scoutmaster minute” and then the meeting is ended. Our troop offers at least one campout a month (some months have more than one). We do both High Adventure (HA) campouts and regular campouts. An example of a regular campout was going up to Lake Dillon to go camping and canoeing with our troop canoes. An example of a high adventure campout is when some of the scouts snowshoe to one of the 10th Mountain Division hut systems outside of Aspen. Our troop also attends a week-long Boy Scout Camp and offers a High Adventure trek each summer. In the past we have attended the Peaceful Valley, Spanish Peaks, and Medecine Mountain Boy Scout Camps as well as to the Grand Teton and Yellowstone National Parks. Our past High Adventure treks have included Philmont Scout Ranch, Florida Sea Base, and crewing a 3-masted schooner around Catalina Island, California. Our troop is fully equipped with equipment for year-round camping including: 4-season tents, camp stoves, lanterns, fully equipped patrol boxes, climbing equipment, troop trailers, troop canoes, and a sailboat. Our troop has 50 Eagle Scouts and counting. It is the troop’s goal to enable each scout with the skills and personal growth in leadership to obtain the rank of Eagle Scout. You may also refer to the “Eagle” page on this website for a list of our Troop's Eagle Scouts. When you become an Eagle Scout it always stays with you even as an adult. We have 14 adult leaders that are Eagle Scouts. Their names include: Anthony Berris, Tim Bougan, Steve Boyd, Steve Carlson, Stephen Cherneski, Michael Cherneski, Brian Fox, Gary Goldberg, John Guthrie, Ted Koerner, Tom Mathys, Tom Shockcor, Dave Tweed, and Doug Waltermire. Our troop is active in community service projects throughout the year. The projects vary from sponsoring families around the holidays, to highway cleanup (our troop has adopted a section of highway in the Colorado Adopt-A-Highway program), to supporting local non-profit groups through our Eagle projects. 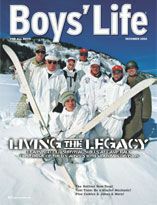 Troop 637 was featured on the cover and in a feature article of Boys' Life magazine for December, 2002 (click the picture to read the article). The troop hosted the 2002 Klondoree winter camping and competition at the former 10th Mountain Division base in Leadville, Colorado. The Klondoree honored the World War 2 veterans of the US Army's 10th Mountain Division. Over 1200 scouts from across Colorado attended the event. The Klondoree was honored by a visit from a group of World War 2 veterans of the 10th Mountain Division, a visit by the US Army special forces group displaying their gear, and a visit by the 10th Mountain Division Living History Display Group dressed in authentic World War 2 uniforms and gear. The group even brought a 1945 Studebaker M29C Weasel (the granddaddy of today's Snow Cats) that was used by the 10th. In addition, some of the scouts built, and slept in, quinzees which were needed because the temperatures on the first night dipped down to 26 degrees below zero. The campout culminated in a chapel service, the scouts stretching out a massive American flag (50'x100'), and a flyover by a formation of F16s. Visitors are always welcome to our troop meetings. If you would like to find out more about our troop, you can reach us through the Contact Us link on this website.